The Providence Eruv — a symbolic perimeter that enables those who observe traditional Jewish law to carry items on the Sabbath — now extends to the Brown and RISD campuses. PROVIDENCE, R.I. [Brown University] — For Jews who strictly observe Jewish law, the Brown University and Rhode Island School of Design (RISD) campuses have just become much more practical to navigate on the Sabbath. At a Brown RISD Hillel ceremony on April 4, community members dedicated an extension of the Providence Eruv — a symbolic enclosure that allows those who follow Jewish law, or halakha, to forgo some of the restrictions on movement imposed during the Jewish Sabbath. The extension incorporates the campuses of Brown and RISD and enables observant students, faculty and staff members, and visitors, to now carry objects from one place to another on campus during the Sabbath, an action that is normally prohibited. From sundown on Friday to sundown on Saturday, when Jews observe their day of worship, those who follow halakha are not permitted to carry any object, regardless of its purpose, from the private domain, such as the home or the synagogue, into public areas, explained Rabbi Michelle T. Dardashti, Brown’s associate chaplain for the Jewish community. “The concept of an eruv is designed to establish parameters of communal Jewish space and thus increase the ability to engage in the mitzvah of oneg Shabbat, the command to enjoy the Sabbath,” she said. An eruv must be set up in accordance with Jewish law and, in effect, transforms public space into private space so that restrictions on carrying objects do not apply within its borders. 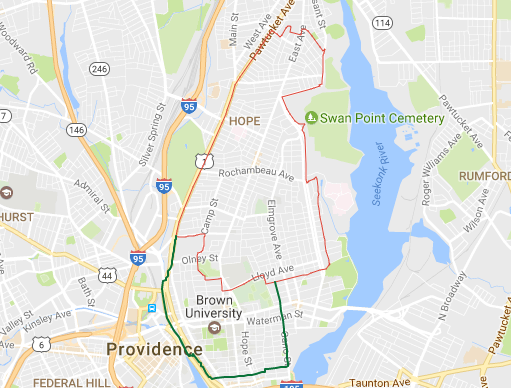 The Providence Eruv was established 30 years ago and encompasses much of the city’s East Side and adjacent parts of Pawtucket. Its border is marked by a thin wire strung between telephone and electric poles, with the Providence River serving as its western perimeter. Within the eruv, observant Jews can walk outside on the Sabbath while carrying objects, such as house keys and prayer books, or while pushing strollers as they walk to synagogues or other community gatherings. A map of the Providence Eruv. The red line marks the eruv established thirty years ago; the green line marks the new extension. With the inclusion of the Brown and RISD campuses in the eruv, observant Jews will be able to perform actions on campus during the Sabbath that are integral to college life — carrying student IDs, for example, or taking books to the library and bringing food to community gatherings. In her remarks at the dedication ceremony, Brown President Christina Paxson said that University’s inclusion in the eruv will help attract students who observe traditional Jewish law. It also bolsters Brown’s dedication to including all religions in the life of the campus, she said. The centerpiece of the eruv ceremony was the presentation of a plaque containing a silver dollar to Providence Mayor Jorge Elorza by Rabbi Yechezkel Yudkowsky and Marc Diamond of the Providence Eruv Corporation, which established and maintains the eruv. The silver dollar is symbolic payment to the City of Providence for allowing and enabling the extension of the eruv. In addition to the plaque presentation and Paxson’s remarks, the ceremony included a Hebrew invocation by Yudkowsky, which was then read in English by Brown Chaplain Janet Cooper Nelson, and a traditional prayer for the welfare of the government given by Dardashti. To design and engineer the eruv extension, a process which took three years, Brown RISD Hillel worked with multiple partners, including the Office of the Mayor, Brown and RISD officials, the Providence Eruv Corporation, local Jewish religious and community leaders, the National Eruv Initiative, local utility companies and numerous city departments, including the police department, parks and recreation, and public works.